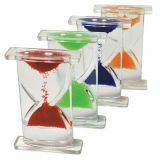 Set of 4 large rectangular sensory liquid pack with hourglass shaped internal cavity containing tiny colorful bubbles that float to the top. Size: 4.95" x 3.35". 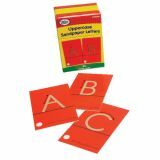 Beginning readers and special needs students will benefit from the tactile experience of these letters. These 4-1⁄4" x 2-5⁄8" cards are covered with fine yellow sand and help students make the connection between the physical movement of forming letters and the actual letter shapes. The uppercase set contains the 26 standard uppercase letters. 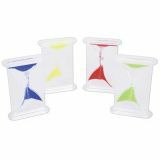 The lowercase set contains the 26 standard lowercase letters plus two alternative forms of l and t.
Set of 4 small rectangular sensory liquid pack with hourglass shaped internal cavity containing colorful seed-like bubbles that float to the top. Size: 2.60" x 1.75". Set of 8 sensory Perception Semispheres measuring 2" dia. 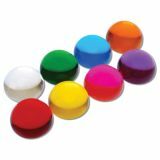 Includes translucent clear, red, orange, yellow, green, blue, pink and purple pieces. Feeling smooth and soft to the touch, the very youngest children will enjoy handling them in free sensory play or as part of a treasure basket collection. Older children will find them fascinating as they hold them up and look through to see the world around them in different colors. When a Semisphere is placed on top of an object it magnifies it by 4 or 5 times to give a view that is both a different color and enlarged. Holding two or three Perception Semispheres together creates new colors and hues; using the Semispheres on a light panel will enhance the children's opportunities for color mixing. 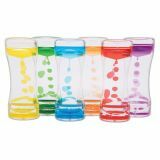 A set of 6 large sensory liquid towers in a rainbow of colors! Each tower contains two, divided reservoirs of colored liquid creating two streams. As the colored liquid cascades to the bottom at varying speeds, the droplets may overlap creating a fascinating effect! Size: 2.16" x 5.75" x 1.38". 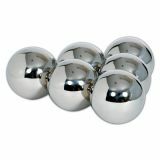 A set of 6 reflective mirror balls that look identical, but all have individual characteristics. Some wobble when rolled, or turn and won't roll in a straight line, some feel funny when twisted, spun or shaken and others make different shaker or rattle sounds. The shiny mirror surface provides a distorted fish-eye lens reflection which is fascinating for children to observe. They are robustly constructed from hard wearing stainless steel, are lightweight, smooth and tactile to handle and can be of particular appeal to children with special needs, or for those requiring inspiration in creative language. Size: 3.94" diameter. Designing and drilling just got easier–and even more fun! Now, kids can power up the creativity with a brand-new version of the best-selling Design & Drill Activity Center! 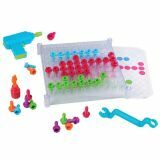 Using a kid-friendly, translucent mini-drill, hand screwdriver, or combination wrench, busy builders can drill colorful bolts directly into a see-through base, easily following the pattern card or creating their own, custom designs. Clear the way for creativity! Use the SiliShapes® Sensory Circles to explore textures and enhance their sense of touch. 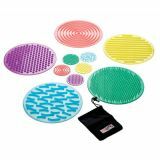 Set of 10 textured circular disks made from ultra-soft flexible silicone - 5 large (9.75" dia.) and 5 small (3.15" dia.). On the surface of each circle is a pattern which is distinctive and different from the rest of the set. Children can feel these textures and discover their differences by placing the small circles into the "mystery bag" provided to describe or predict the pattern they are feeling; or by using their feet they can walk over the large sensory circles to see if they can tell them apart. No previous experience with American Sign Language is required! 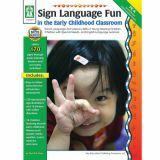 Help all students—hearing, hearing-impaired, deaf, special needs, gifted, and English language learners—to improve language and literacy skills with Sign Language Fun in the Early Childhood Classroom. This 64-page resource book helps students improve verbal communication, visual discrimination, spatial memory, and early reading skills. The multi-sensory approach helps all students improve language and literacy skills. Build basic skills through sign language with special-education learners in pre-kindergarten–K using Sing, Sign, and Learn! 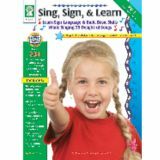 This 64-page early learning resource teaches more than 230 American Sign Language signs through 25 songs. Build language and literacy skills and motivate young learners with their desire for constant movement while providing an atmosphere of play and fun. The book supports NCTE and NAEYC standards. 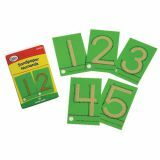 Beginning readers and special needs students will benefit from the tactile experience of these letters and numbers. These 41⁄4" x 25⁄8" cards are covered with fine yellow sand and help students make the connection between the physical movement of forming letters and the actual letter shapes. 10 Numerals. 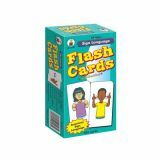 Sign Language flash cards provide a fun way for children to learn American Sign Language. Beautifully illustrated, these flash cards are an excellent way to introduce basic skills, reinforce memorization, and support good study habits. This two-sided educational card set is self-checking and features rounded corners for easy sorting and includes 105 set cards (6" x 3" each) and 1 resource card.